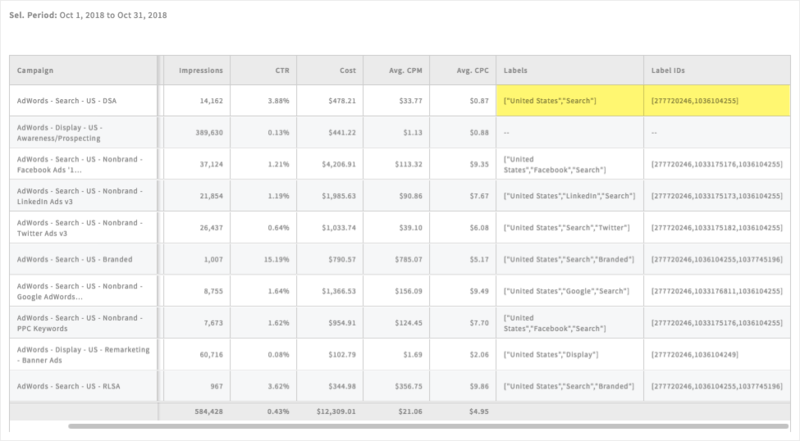 Filtering by Google Ads label is a great way to hone in on key data in your reports. This type of filtering works a little bit differently than most widget filters and is only available in Google Ads Direct widgets. First, you'll need to identify your Google Ads labels and label IDs by creating a Google Ads Direct table. Once you have matched the label ID to the label by which you'd like to filter, copy the label ID. You'll paste this ID in to the "Label ID" filter in the Filters tab of the widget builder. Step 1: Create a Google Ads table by clicking on the Table widget icon under the Google Ads (formerly AdWords Direct) heading. Step 2: Select Campaigns from the "Show Me" drop-down. Step 3: Add "Label" and "Label ID" in the Fields section. Make sure these fields are next to each other, then click Save. Step 4: Locate and copy the label ID (without brackets) for the label you'd like to filter by. 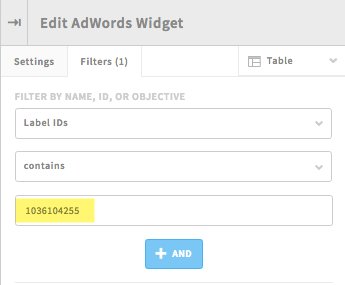 Step 5: Click into the Filters tab of the widget builder for the widget you want to filter and choose Label ID from the top filter drop-down. Step 6: Paste the ID you copied earlier and click Save. Still have questions? Please reach out to us at support@adstage.io.